The Caribe Royale Hotel is a gorgeous resort hotel and conference center located just a few miles from the heart of Orlando’s key attractions Universal Studios, SeaWorld Orlando and Walt Disney World. The hotel has recently added a wonderful wedding venue which is certain to add much buzz in the Orlando wedding industry. It features a gorgeous pavilion set on a beautiful lake with a huge fountain (featured in the attached photo). Brittany and Justin chose to hold their elegant wedding in this new and pristine setting. 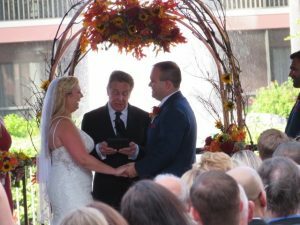 Lon Tosi from Sensational Ceremonies worked with the couple to create a fantastic custom wedding ceremony that touched on their love for each other and included special words for Lon to read to each of them. There was also a wonderful reading entitled Happiness In Marriage that was written by Lon that spoke of the key efforts that each marriage needs to be truly happy. Among them are “Pay Attention to one another”, “Act like you are still dating”, “Be a best friend”, and many more. Also the couple chose to have a reading done by Lon entitled The Blessing of The Hands which speaks of the importance of each person’s hands in the life-long journey that they are setting off on. It takes them from the point when they are young and strong through to the time when they will be “aged”. It is a beautiful reading and added so much to the ceremony. This was the first wedding ceremony to be held at the new site, and it was indeed an all-star list of vendors that delivered a perfect event for this couple. Of course, the staff at Caribe Royale was spot on with their service. The wait staff was elegantly dressed and presented a perfect image. Ashley and Hannah from the Caribe did an amazing job of keeping everything on schedule to perfection! Our DJ Rocks provided the sound for both the ceremony and receptions and as usual everything was just perfect. Atmospheres Floral provide the floral arrangements for the ceremony and reception – and, as usual, their work was done to perfection! Victoria Angela Photography took some amazing photos and captured everything on video as well. Perfect! The Caribe Royale has an excellent catering group and provided all needs for the cocktail hour and reception. Brittany and Justin, you are off on a great adventure and we all as a team want to wish you much luck on your great adventure!